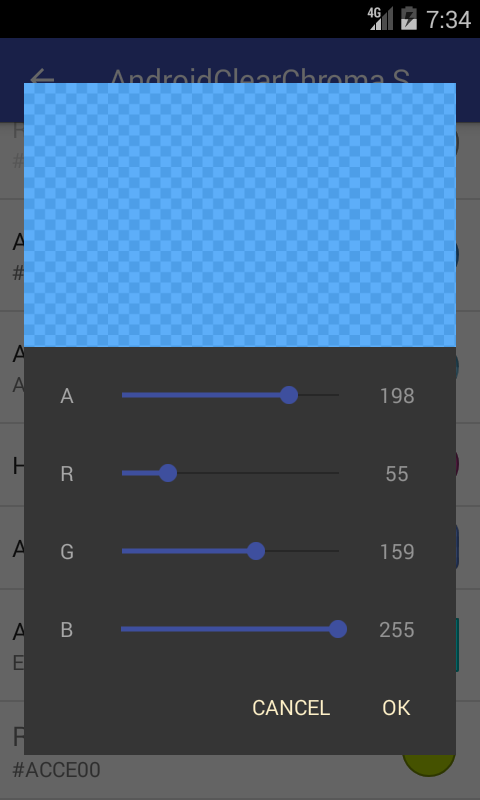 A customisable material color picker view for Android. can be used as Dialog, Fragment or as Preference. You can contribute in different ways to help. Add features by a pull request. Donate (｡◕‿◕｡) will be used to create free and open source applications. 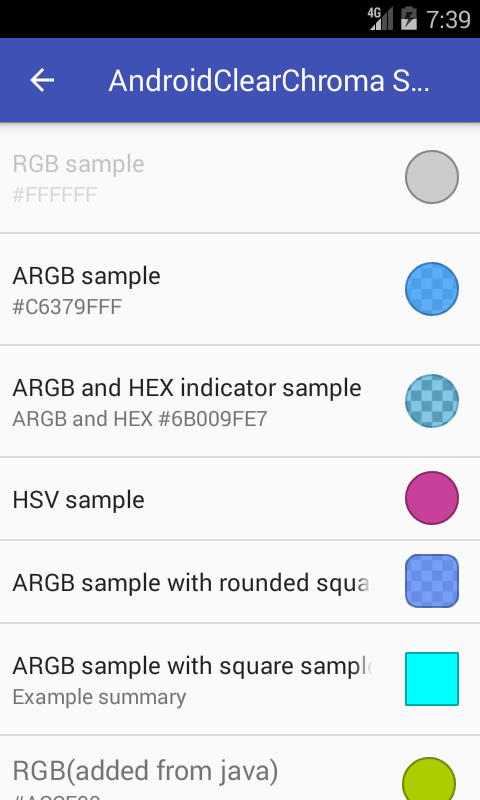 AndroidClearChroma uses AndroidX as compat library. Your parent Activity or Fragment must implement the listener interfaces. OnColorSelectedListener contains two methods : void onPositiveButtonClick(@ColorInt int color)called when positiveButton is clicked and void onNegativeButtonClick(@ColorInt int color) called when negativeButton is clicked. 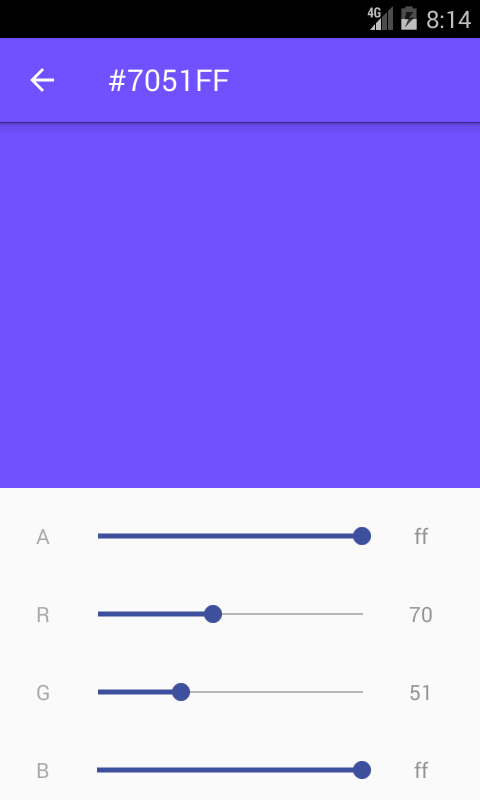 OnColorChangedListener contains method void onColorChanged(@ColorInt int color) called when color is changed in view. 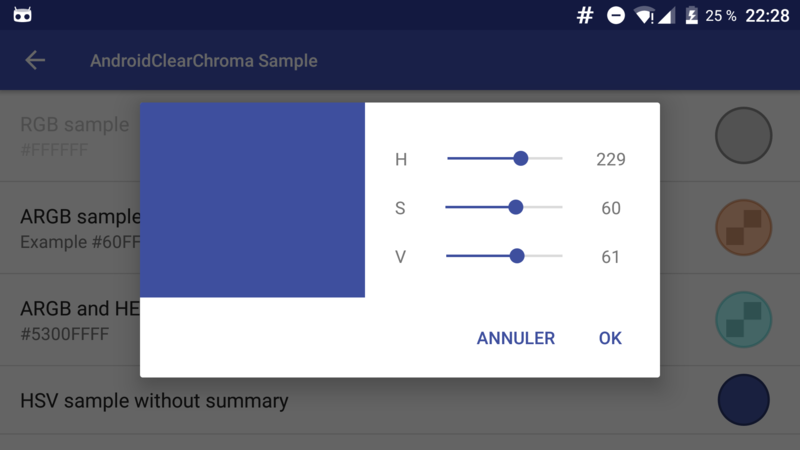 AndroidClearChroma uses the DialogFragment style of your app. Use ChromaPreferenceFragmentCompat as a superclass for managing fragments in Preferences. Then get the color from the preference. Unfortunately, you can't customize a fragment in XML. You must initialize the fragment programmatically and use the FragmentManager to add it to your layouts. See FragmentColorActivity.java for complete sample. This project is a fork of VintageChroma by Pavel Sikun.